While we’ve been gathering evidence and insights from the local area around Yateley, Darby Green and Frogmore, regular reports are being published nationally about transport and travel which also provide valuable evidence for us to reflect on about our own situation locally, as we consider the topic with regard to a future neighbourhood plan. We thought it would be useful to report back on a few of them, as they provide useful context for our deliberations, and useful evidence – and help us make connections between various points. 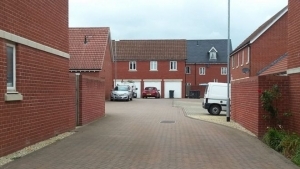 Designed as if pedestrians don’t exist (Photo: Transport for New Homes). Soon after we began our work, an organisation called Transport for New Homes launched a report towards the end of October (click here) which argued, on the basis of research gathered on over twenty developments around the country, that housing developments are being encouraged which push residents towards “car based living” by failing to include public transport, or pedestrian infrastructure. It leads many to argue that young people often feel they have no other choice than to rely on a car. 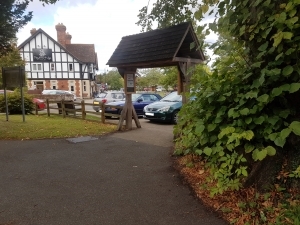 Do new developments (like that we are seeing at the ‘Urnfield‘) do enough to incorporate direct pedestrian routes to our village centres, for example? Are they connected enough to public transport networks, or adequate cycle networks? This could be a issue of direct relevance for the neighbourhood plan. (You can read more reports from this research from Building magazine; from The Guardian, two reports from the BBC here, and here). 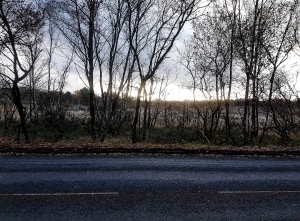 A stunning view beckons of Yateley Common, beyond the main Reading Road, between Yateley and Frogmore. But are the transport links so stunning? The Transport for New Home report followed a piece of work earlier in the year by the Transport Knowledge Hub, who commissioned KPMG to look into the issue. 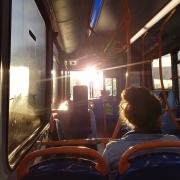 They produced ‘Sustainable transport – the key to unlocking the benefits of new housing: a report to Greener Journeys‘ (click here for full report, and click here for article). It makes the point that future development should only take place where car dependency can be reduced, and sustainable transport networks of cycling, walking and public transport can be viably supported. This is vital in order to deal with issues around congestion, drags on productivity, as well as wider economic, environmental and social benefits. More work is due on this in the New Year, and we will certainly be keeping our eyes peeled for it to help with our work. In the middle of November, the Campaign for Better Transport launched a report, ‘Integrated Transport: a new generation of interchanges’ (click here for full report, and click here for article). The report found that current bus, rail and coach services are poorly integrated, making door-to-door public transport difficult. Already, responses to our own survey are picking up on this point. Natural interchange points (for example, Farnborough Main), cannot be reached by a direct bus from Yateley – except for the college bus (which stops just nearby only twice a day), and the No. 2 service (which takes around an hour and three-quarters to cover a distance of five and a half miles). And if anyone comes back via Camberley from Farnborough, the last bus back from Camberley is at 8.50pm! People who rely on public transport make Blackwater their interchange point for services to Reading, Guildford, and on to London and Gatwick, but no imaginative thought has been given as to how buses can integrate accessibly with that station – instead there is a huge number of steps down from the main A30. Increasing delays seem to be a feature, whatever form of transport you use. Longer commute times, whether car, bike, cycle, bus or train! Also in the middle of November, the TUC issued analysis to mark the annual ‘Commute Smart Week’, organised by Work Wise UK. It listed all the various forms of commute, and how their length of time had changed in the ten year period between 2007 and 2017. The average commute, per day had gone up from 53.6 mins in 2007 to 58.4 mins in 2017. In the South East, the figures were slightly higher at 57.4 mins (2007) and 62.0 mins (2017). (Click here for a report). During the period we have been doing our work, some of these commuter delay issues have loomed large. Over-running engineering and strikes on South Western Railways can have a dramatic impact on people’s abilities to make work, and other appointments. And that often only serves to put more traffic on the roads. Anyone who is familiar with the rush hour will know that the attempt to get on the M3 at either junction 4, or 4a in the morning makes for chaos at both The Meadows, or long queues on Cricket Hill Lane heading for Minley. Anything that has a knock on effect can have a dramatic effect on those commute times, whatever form of transport you use. Cars are a prominent part of village life – can we do more to encourage walking and cycling? Should we? A recent report in November 2018 by Public Health England (click here for full report) – “Cycling and walking for individual, population and health system benefits: a rapid evidence review” supported the government’s strategy to make walking and cycling the natural choice for journeys, and improve health for communities. But are local authorities at all levels – town, district and county council – doing all they can to make a reality of this? Are some journeys only realistic in a car (whether your own, or in a lift), because of unrealistic scheduling, for example? Towards the end of November, the Government published its response to a consultation on a Cycling and Walking Investment Strategy safety review (click here for full report). There were over 14,000 responses to the consultation. Amongst a range of outcomes, it announces that local authorities will be encouraged to increase investment in cycling and walking infrastructure to 15% of total infrastructure spending. But it’s not all about money. Where there are cycle lanes, there should be improved enforcement against parking in them. 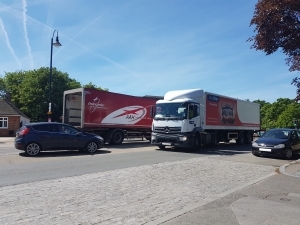 However, it’s a two-way relationship, and the announcement said it wanted to see more engagement with cycling and walking bodies to develop a behaviour change campaign, to improve relationships between them and drivers. Lots to reflect on from this publication! Filling station one of two within a matter of yards, right in the heart of the town. Ending sales of petrol and diesel cars – are we ready? A major policy shift indicated in recent months has been the move towards electric vehicles. The Government has indicated in its ‘Road to Zero’ strategy (click here for full report) that by 2030, half of all car sales, and 40% of vans will be electric. By 2040, petrol and diesel sales will be phased out completely. There are indications that pressure will come for that date to come sooner. It has been reported that almost 9 out of 10 fleet managers plan to switch the majority of their fleet to electric or hybrid-electric vehicles before that date (2028 – for report, click here). And the Business, Energy and Industry Select Committee said in October that the 2040 date for ALL petrol and diesel sales to be ended should be brought forward to 2032, to encourage greater investment in the infrastructure needed (click here for report). It’s worth reflecting on this issue here. 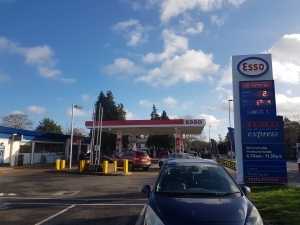 There are NO electric vehicle charging points in Yateley, Frogmore or Darby Green, yet sales of new petrol and diesel vehicles could be coming to an end by 2032. 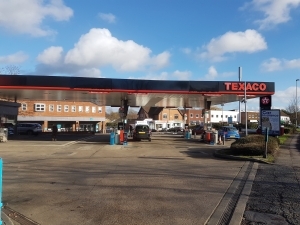 On the other hand, unlike most towns of our size (and much larger), we have two big petrol and diesel filling stations right in the heart of the town. Irrespective of whether you think their location in the town is correct, it is worth reflecting on how we have got to a point where we have prioritised cars over pedestrians in the heart of our town to such a extent, at a time when government policy is to end sales of petrol and diesel driven vehicles in just over a decade. At some point, something needs to be done to think about how we make provision for the charging facilities which will be required – as Tesco and VW announced they are doing in their announcement on the 30th November (click here for report). Fuel station two of two in the heart of the town – but not a single electric charging point for miles. 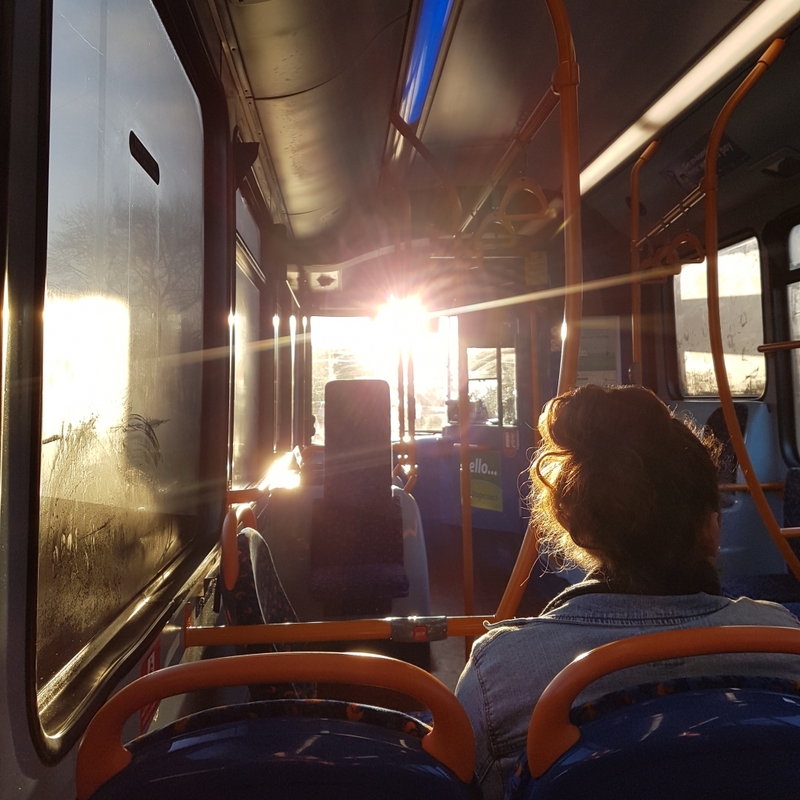 Back at the end of October, a report by the County All-Party Parliamentary Group of MPs and the County Councils Network said that rural areas were in danger of being the ‘least socially mobile’, in part due to issues like the access to transport network (click here for more details). There are only certain kinds of transport issues which a neighbourhood plan can address. We can be specific about how those can be addressed by a particular policy, but many others may only be able to be signposted to be addressed in other ways, or as aspirations. That shouldn’t stop us considering them – and it is becoming apparent that this is as much crucial within the context of our location within the Blackwater Valley, as it is within the Hart District – something we will return to. Neighbourhood plans must meet basic conditions set out in legislation, and one of those is that they help deliver sustainable development. Appropriate transport can have a huge impact on an area’s capacity for growth and sustainability as a community. Something else we will return to in a future post. Before signing off on this update, as promised in previous posts, we wanted to introduce you to the remaining members of our subject group. 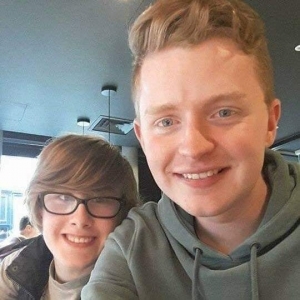 Charlotte Richards (left) with subject group co-lead, Luke Buckland (right). Charlotte Richards: Charlotte is a member of the community at Yateley Industries. She brings a wheelchair user’s perspective to the group. Charlotte went to Frogmore Community College. Above: Wilf Hardy, who has been a trustee and treasurer for Yelabus. Wilf Hardy: Wilf is a qualified accountant and former operations manager for a multi-national company. He has been a trustee, and treasurer for community transport service Yelabus. 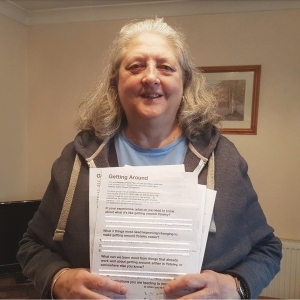 Above: Sue Smith, pictured with some of the consultation forms she has been collecting around Frogmore. Sue Smith: Sue lives in Frogmore. She has campaigned for many years on behalf of residents in Frogmore and East Green over lost bus services, and general access issues. She is a regular user of community bus services. 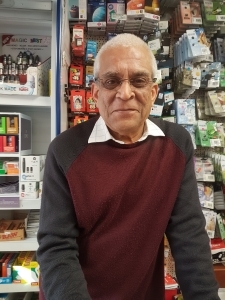 Yogesh Patel: Yogesh is a local businessman, running The Newsletter newsagents and stationers in The Parade, on the Reading Road. 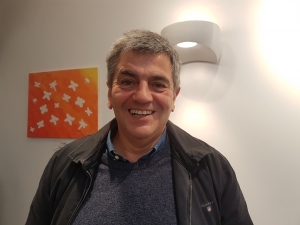 In the course of his business, he speaks to many Yateley residents and visitors – and is familiar with many of the issues we are exploring, such as parking.